This June we are spotlighting author Leo Lionni as part of our Virtual Book Club for Kids! All of the Virtual Book Club for Kids participants will be sharing a craft or activity that goes along with one of Leo's books. 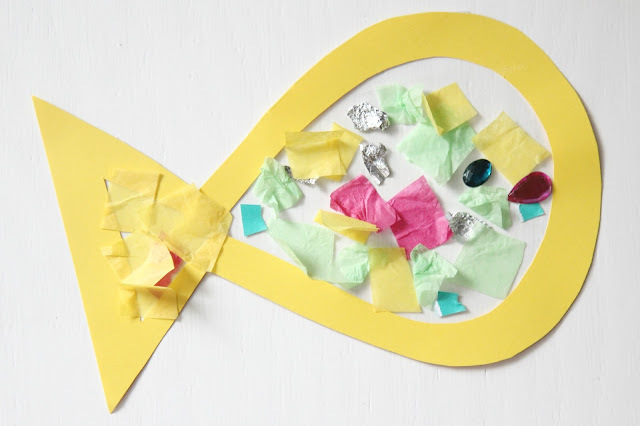 This month we decided to read the book Swimmy by Leo Lionni and then my kids helped me come up with a sticky fish craft inspired by the book. 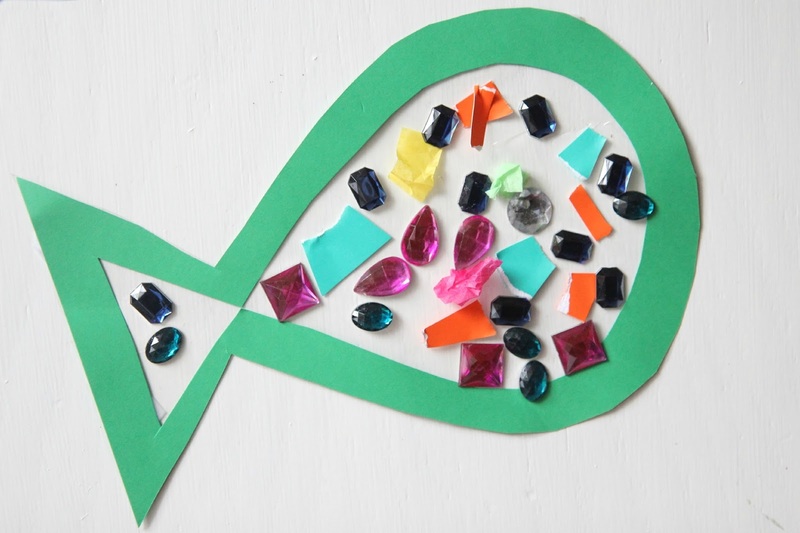 We opted for more colorful fish than just black and red. 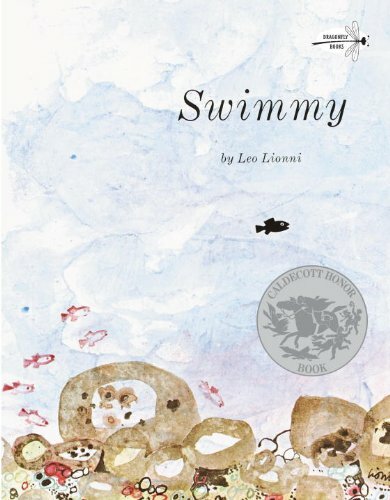 Swimmy by Leo Lionni is a sweet book about a fish who teaches his friends to use teamwork and some creativity to overcome danger. I love the artwork in the book and simple story. 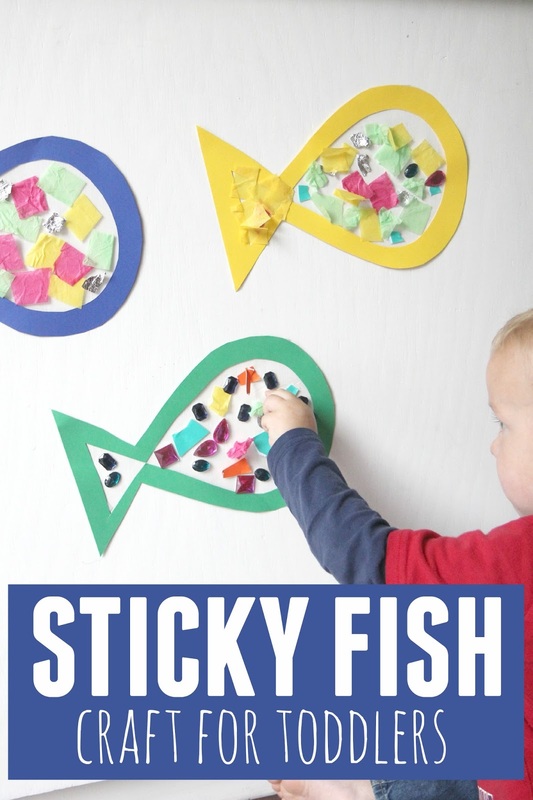 After we read Swimmy we got started with our sticky fish project! 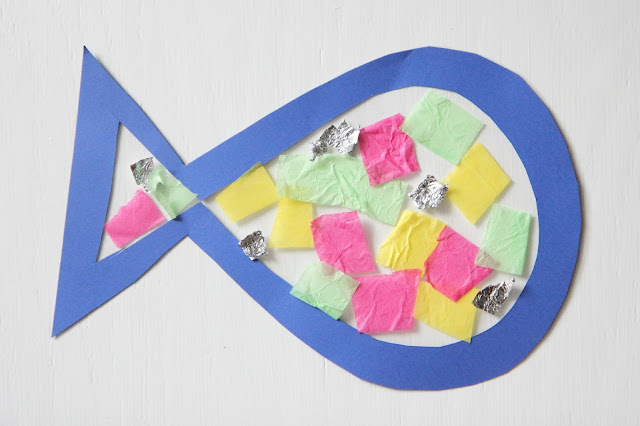 First I cut out fish from cardstock and then I cut out the centers of the fish as well. After that I mounted the fish onto contact paper (sticky side up). Next I also cut some tissue paper into little pieces. Once the fish were placed on the contact paper and paper was cut we were ready to get started! 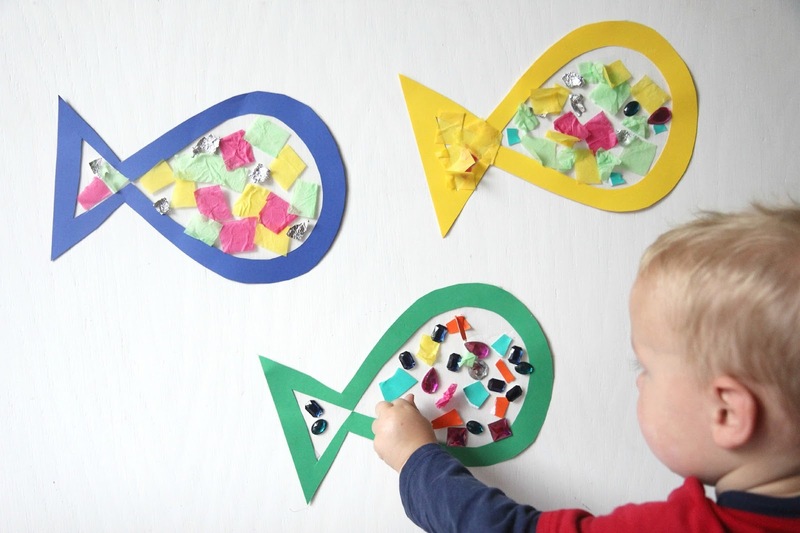 My toddlers and big kids had fun decorating the fish with balls of tissue paper, scrap paper, pieces of foil, pom poms, jems, etc. 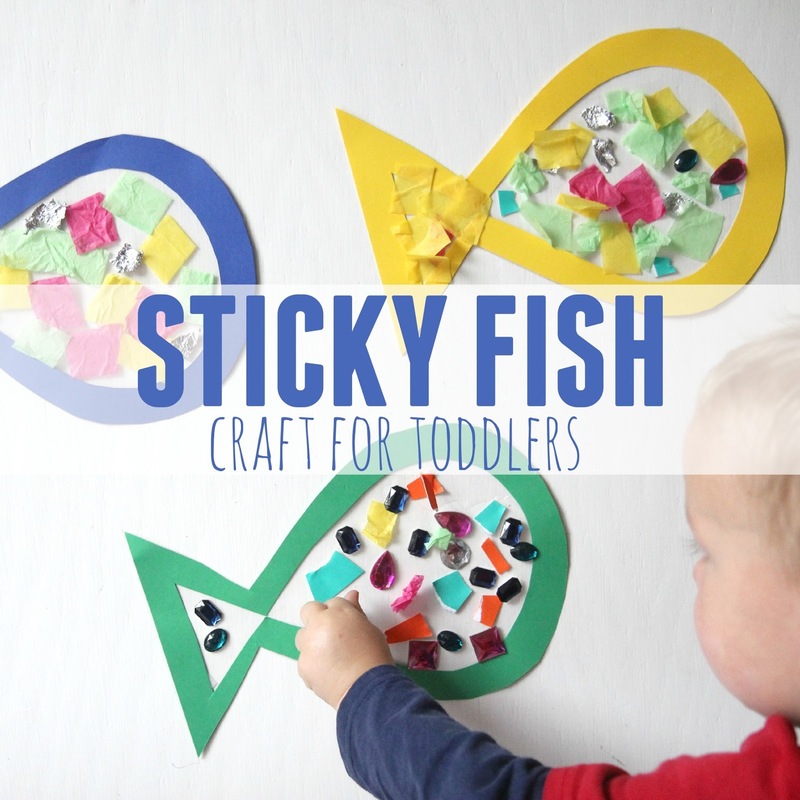 The best part about sticky walls is that the activity can be very open ended and is not restricted by time. We left our sticky fish out for quite awhile and kids kept adding to them and decorating more. If you'd like you could use yours as a traditional suncatcher after you trim off the excess contact paper. We kept ours on the wall instead as an opened-ended play and explore area. The kids had fun putting things on the sticky wall and then adding something else later. As you can probably tell, the jems were a big hit! Once our sticky wall was finished the kids had fun moving things around and adding more things to it. This activity is such a fun way for toddlers to explore textures and colors. We have several other cool Leo Lionni inspired crafts and activities being shared today by our Virtual Book Club for Kids participants! Click on the links below to see what they've been up to. If you did a craft or activity to go along with any Leo Lionni books, come tell us about it over on my Facebook wall. These would be so cute hanging on the window with other sea creatures. Awesome idea! We love sticky window activities and we leave them up for a long time too. My kids would love this! Thank you for sharing this! My kids love sticky wall activities, too. I love all of the textures you explored with this! Love this idea! They turned out so cute!